In the Name of God Amen. I Frances Alexander desire that my youngest son Lee M Alexander have possession of my big mare and her Colt the white mare and the mule & black horse with a white nose five in number and all the farming utensils consisting of the waggons cart ploughs &c and also three of the best beds bedsteads and furniture & the rest divided amongst the three sons William Richard & Gustavus, and all the table clocks knapkins &c for Lee also Richard Rachel & Gerry for Lee & Ann to Mrs Swann and the rest of the same family to wit Milleys family equally divided among the three sons William Richard & Gustavus provided that the other brothers & sisters do not compel W B Alexander to Repay the money that I receive for the sale of Eve, Mary & child, In that case they are all to go to W B Alexander, also all my Just debts due to me to be collected to pay off my Just and lawful debts and the balance to be equally distributed among all my children except my sons Charles's heirs and my daughter Mrs Chapman all of whom I think are amply provided for; It is my dying and last request to my son Lee to be prudent & take care of his property and attend to the directions of his elder Brothers and always treat them affectionately in this house, and that the above named slaves that are bequeathed to my son Lee are given him provided he will hold them in his own use and possession and if he should be desious of liberating them they are to belong to my other sons William, Richard & Gustavous, and a sum of one hundred dollars due from John Causine to be refunded to him if he should pay, to be refunded to him if he should pay it, and that a sum due to R B Tyler assigned to B E Harrison to be paid out of my property, the present crop of wheat &c &c and two sows & pigs to my son Lee and also the rye growing in the corn field and all the cattle, oxen, Cows Calves &c to be given to my dear son Lee, all the vegitables in the garden to my son Lee, and also the fowls of all sorts, and every thing not mentioned herein to be given to my son Lee, & all the China & earthenware knives & forks and third of the silver to be given to my Son Lee, the two teapots & silver carr[?] to be included in his part. 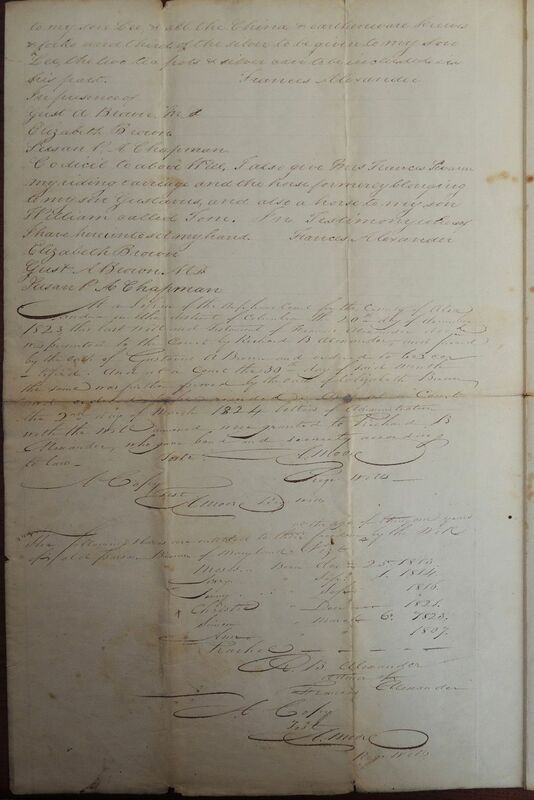 At a Session of the Orphans Court for the County of Alexandria in the district of Columbia the 20th day of december 1823, this last Will and Testament of Frances Alexander decd was presented to the Court by Richard B Alexander, and proved by the Oath of Gustavus A Brown and ordered to be certified. And at a Court the 30th day of said month the same was further proved by the oath of Elizabeth Brown and ordered to be recorded. 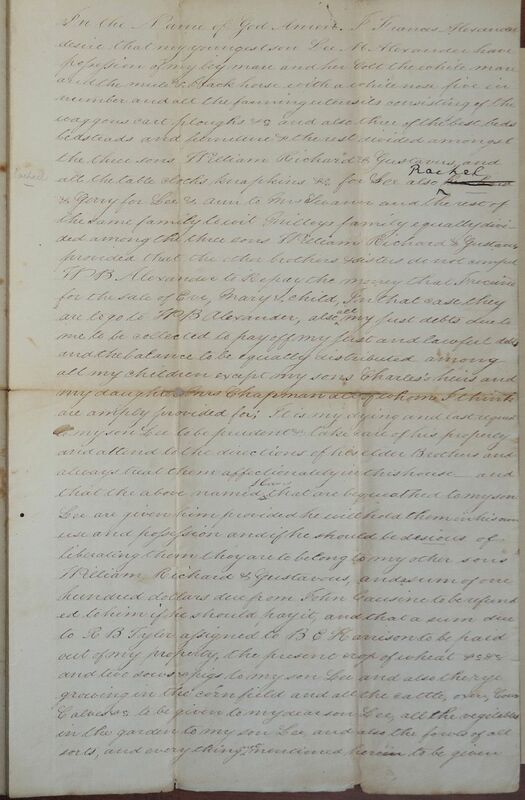 And at a Court the 2nd day of March 1824 letters of Administration with the Will annexed were granted to Richard B Alexander, who gave bond and security according to law. 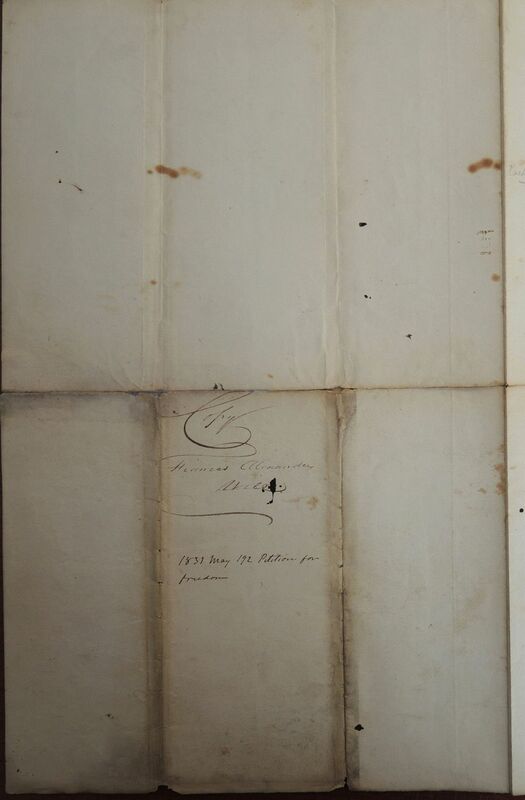 Moses Born decr 25 1813. Jerry " Septr 1 1814. Simon " March 6 1823.